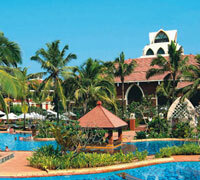 Caravela Beach Resort is one of the finest luxury beach hotels in Goa. 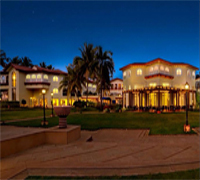 As one of the first few five star hotels in Goa, it enjoys the distinct and unparalleled advantage of proximity to the beach, high ceilings that are an architectural treat and vantage points that offer breath-taking views of the sea, sand and is in the midst of lush greenery around the property. These features result in Caravela Beach Resort offering the rare experience of secluded beauty and virginal beaches and environs whilst keeping you in touch with all the modern facilities. The hotel also features a 9-hole golf course and an Ayurveda Centre, differentiating it from other standard five-star resorts in Goa. Our restaurants welcome you to a host of varied dining experiences. Whether you're craving for an authentic taste of Goa, longing for your European favorite or reminiscing of an Asian delight, the restaurants at Caravela Beach Resort offer a flavor for your every craves. When your eyes feast on a visual delight of exotic tropical beauty, pristine sand kissing the shores of the beach, you know you've reached, the Kenilworth Resort and Spa, Goa. Snuggle up to the comfort and swish amenities of well-endowed rooms, immaculate staff, and flawless service, or simply take on the water sports with a vengeance. At Kenilworth Resort and Spa, Goa, we constantly endeavor towards making your stay a memorable and luxurious one, whether it's business or pleasure. Choose from our range of traditional Goan, Continental or Indian fare cooked to perfection and served to please every palate. 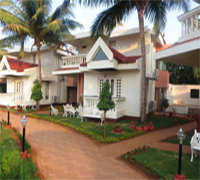 Beleza…by the beach is a boutique resort situated on the clean, pristine and white sandy beaches of Colva in South Goa. The resort gives an experience of residing in an untouched, private and meditative environment. The resort is located in the midst of greenery and tropical plants, with the beach and sea on one side and paddy fields on the other. Beleza comprises of 30 tastefully designed and furnished rooms in a Villa setting, with three rooms in each villa. Each room is equipped with plush and modern room amenities. Resort facilities include an all-day dining restaurant and bar, a beach shack, spa, and gym facility, a large swimming pool with a demarcated kids section and deck for sunbathing, play–area with swings for children, DVDs and books selection etc. 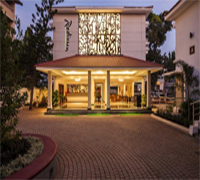 When you choose Radisson Goa Candolim, you can enjoy comfortable accommodation just 500 meters from Candolim Beach. Before you head to the shore, enjoy a soothing massage in the spa, play a game of pool or pick up a book from the library. The Radisson provides a wealth of excellent amenities, including a library, a salon and shops. In the spa, make an appointment for a Swedish, Ayurvedic or aromatic therapy treatment. Satisfy your cravings at our excellent on-site restaurants. The Palms, our multi-cuisine coffee shop, serves chef-prepared Indian and continental cuisine at breakfast, lunch and dinner. At Red Mango, you can enjoy al fresco dining poolside in a romantic atmosphere while savouring fresh seafood and traditional Goan cuisine prepared by our Master Chef. Regenta Resort Varca Beach is located in Varca, South Goa providing a rich experience with its relaxed atmosphere and its dedicated services to all its patrons. 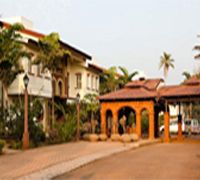 The resort is counted among the best beach resorts in South Goa for providing unparalleled facilities to its guests making it one of the most preferred choices for accommodation in South Goa. With spacious rooms and suites, the resort offers room categories like the deluxe room, pool view room, and luxury suite which are all well equipped with all the modern amenities. Its on-site restaurants like Aqua Grill and Pinxx offers a wide variety of delectable cuisines. The Aqua Grill is an excellent poolside restaurant that offers Indian Cuisines and seafood and the Pinxx serves an array of delightful quick bites and exotic beverages.